John Cervantes and webgod, Randy Fong, came up with the idea of creating a website for the tennis playing public in 2003. To provide information on tennis in San Francisco. This the second reincarnation of the website as much had changed in the city. Randy Fong designed and implemented the website probono for past 5 years. He also created sf tennis courts for all of us to locate all the public courts. As of September of 2012 John will become independent tennis contractor at Lake Merced Golf Club (20+ years) and tennis professional for the St. Francis Woods Association. He was tennis director at San Francisco Bay Club and at the Metropolitan Club. 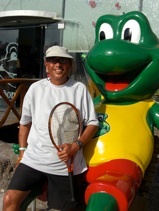 He has conducted tennis teaching workshops in the US, Europe, Latin America and Europe since 1979. He operated the largest private school tennis program for 25 years until 2003. He has owned and operated athletic stores for over 10 years in San Francisco and Los Angeles. In 1996 he has shifted his professional career to community tennis. He was a board member of San Francisco/ Oakland National Junior Tennis League from 1996 – 2000, which became Youth Tennis Advantage, largest provider of free tennis, mentoring and life skills in the Bay Area. He became involved with USTA Northern California Division beginning in 1994 until 2005. He has been involved in Community tennis programs, vice chairman of Adult recreation and chairman of Junior Recreation for 3 years. He was involved with the San Francisco Tennis Advisory Board from 1998 – 2004, and was appointed member of the Strategic Planning Committee for SF Recreation and Park (2001-2003). He was one of the founder/member of the San Francisco Tennis Coalition, until September 2009. Currently he is with San Francisco Junior Tennis League and involved in a new non-profit, goinspirego, using social networking to inspire social change. John Cervantes is a committed advocate for women and children since college, working on creating the childcare facilities at CCSF, board member of a shelter for battered women (La Casa de Las Madres), and advisory council for transitional housing for homeless families (Salvation Army Gateway Program). He supports NOW, SF Political Women’s Committee, and NARAL. He is committed to San Francisco public parks through Neighborhood Park Council and SF Park Trust. Randy Fong has been in working in the information technology industry for over 25 years and is currently a consultant and contractor for many national companies. Without his compassion, commitment and technology background this website would not exist. CityTennis was one of the first websites for public tennis covering both private and public tennis facilities for a city in the United States . Most of all the tennis news is from one source, Bob Larson’s tennis news. He is the best source of tennis news in the world.